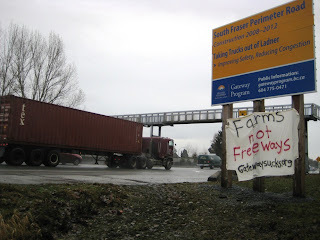 Early this morning concerned citizens took action to try to stop the South Fraser Perimeter Road. 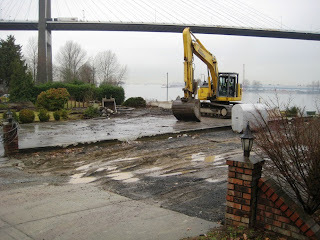 The billion dollar freeway construction project will run along the south side of the Fraser River from from Deltaport Way in Southwest Delta to 176th Street (Hwy 15) in Surrey, with connections to Highway 1, 91, 99 and to TransLink's new Golden Ears Bridge connector. It is being said to reduce congestion and improve the quality of life for businesses and residents, but at a cost more valuable than money. Running along the lagg of Burns Bog, it will have devastating impacts on the bog's ecological integrity. It will cause serious health problems for surrounding residents. And it has already torn up countless homes and farmland. 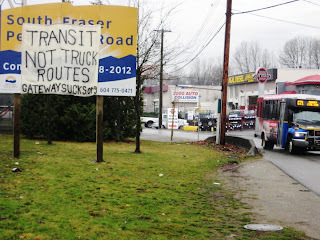 Thankfully there are many concerned people and organizations that are trying to put a stop to this, yet another unecessary freeway. 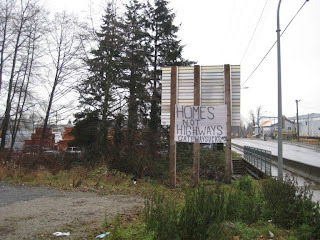 Gatewaysucks, an organization dedicated to stopping Gateway projects such as the South Fraser Perimeter Road, mounted large signs today with strategically placed messages in protest against the project. Below are some images taken this morning by me and my colleagues here at Burns Bog Conservation Society. You can also help stop this "Freeway to Destruction." 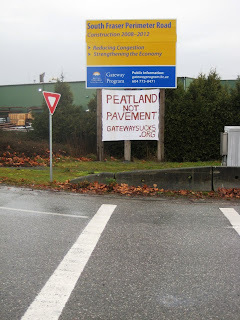 Sign the online petition at http://www.ipetitions.com/petition/stopsfpr/ Speak with your local government representative. Attend a protest. There are many ways that you can help stop this.